Contacts are very important on our phones because everyone needs contacts to get in touch with the relatives, friends, and family. So many times it happens when you need to transfer your contacts from one device to another. If you have purchased a new phone, you will need to transfer the contacts as you cannot copy all the contacts from one device to another. Similarly, if you want to share your contacts with your another device, you will need a method to do this. 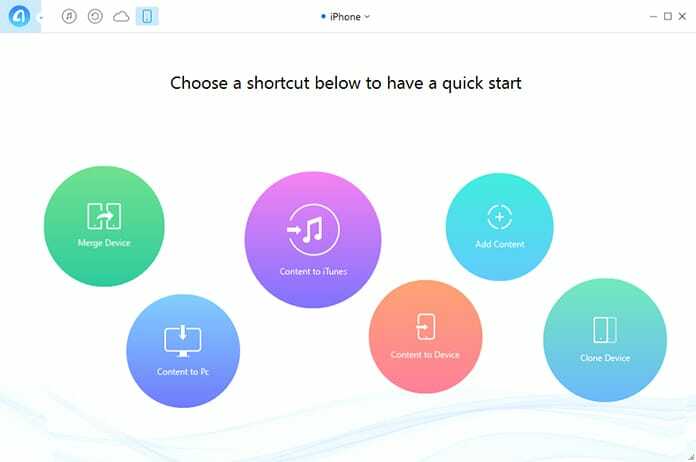 So, in this post, you will learn how to transfer contacts from iPhone to iPhone easily in 4 ways. When it comes to iPhone, it provides us different ways to do this. We have a lot of methods of transferring contacts from one device to another. It doesn’t matter you are using the same iCloud account on either devices or the different one. We will explain to you how to shift contacts from one iPhone to another. The quickest way to transfer contacts from one iPhone to another is using the backup and restore option. 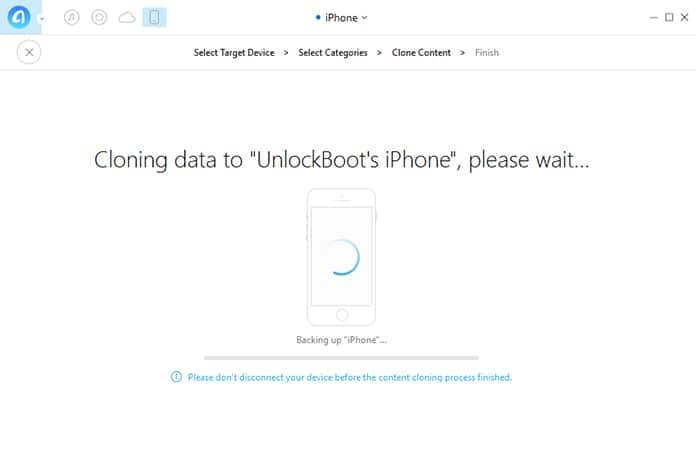 In this way, you will backup your contacts on the device in which you have contacts, and you will restore your contacts on the other device. All this is done through iCloud. 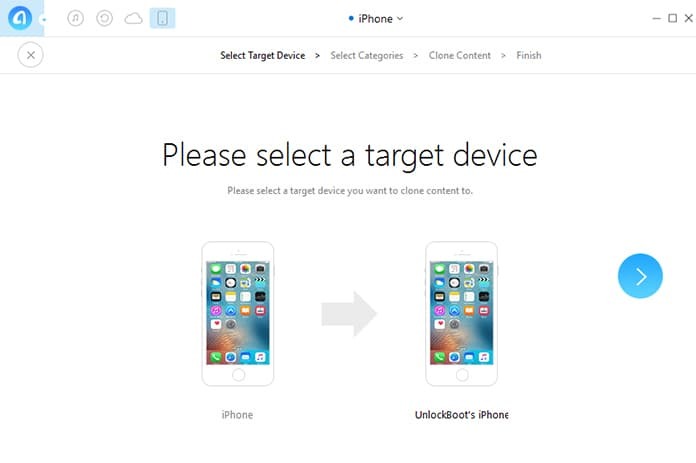 In this method, both the devices must be running the same iCloud account. Another way of doing this job is using the sync option. 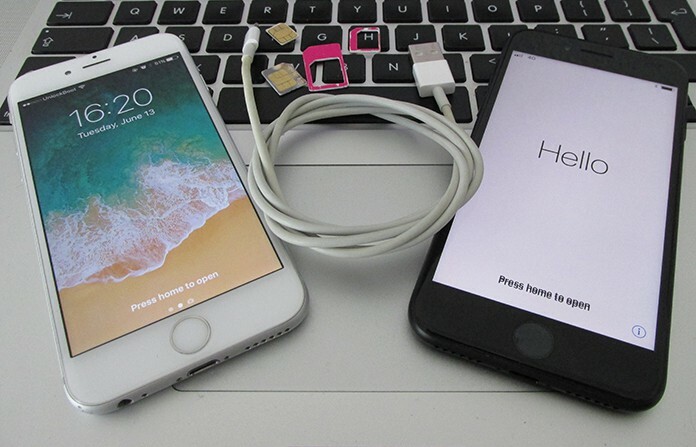 This method is also applicable when both the devices are running the same iCloud account. In this way, you will need to follow some steps which are mentioned below. 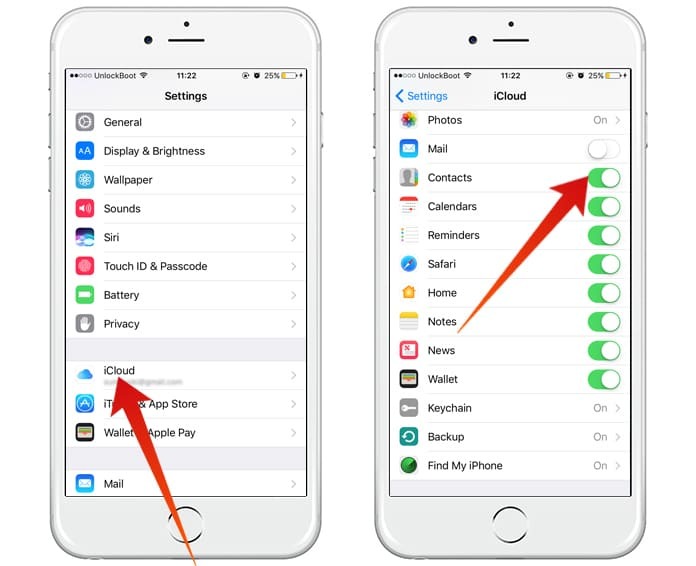 Step 1: Initial to all, click on the Settings option on your mobile and click on iCloud. Step 2: You will see a list of different things including photos, mail, and calendars. You need to click on Contacts option to make it checked. Step 3: After clicking on the contacts option, the iCloud will start syncing the contacts to the iCloud. Step 4: You will have to wait for a few minutes to complete the syncing process. Step 5: Now on the other device, repeat the same process to start syncing the process. Step 6: After some time, the iCloud will complete the syncing, and the contacts will be transferred to the other device. 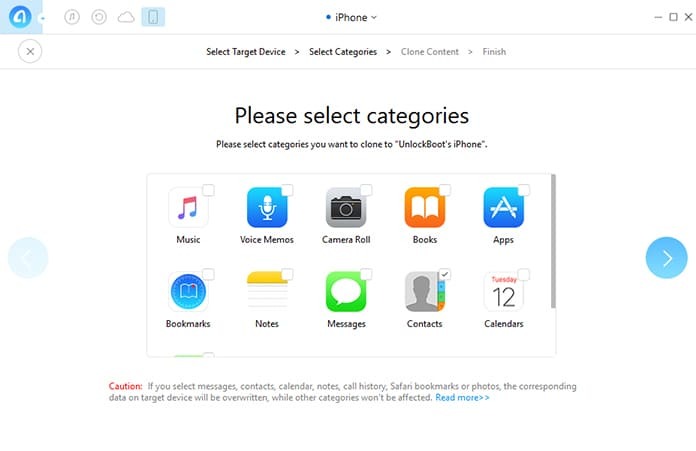 Alternatively, you can log into the web interface of iCloud and download your contacts to the Computer. Then you can upload them to Gmail or Google Contacts and sync with your device. 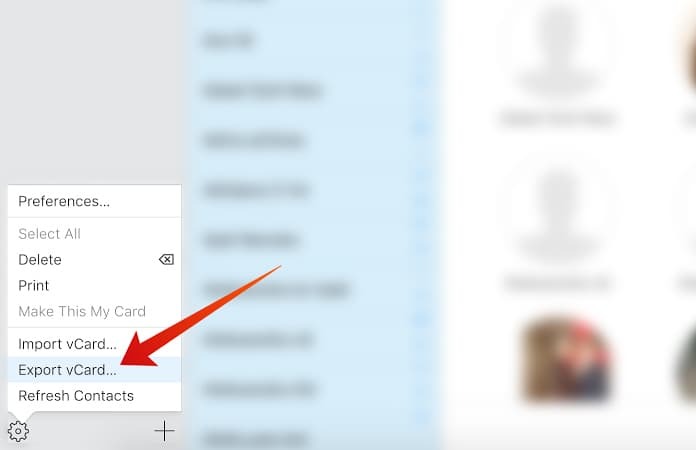 To do that, just sign into your iCloud account from your Computer, go to the Contacts section, select all contacts and click on the Export vCard option to download your contacts. Sign in with the same Google account on both devices. 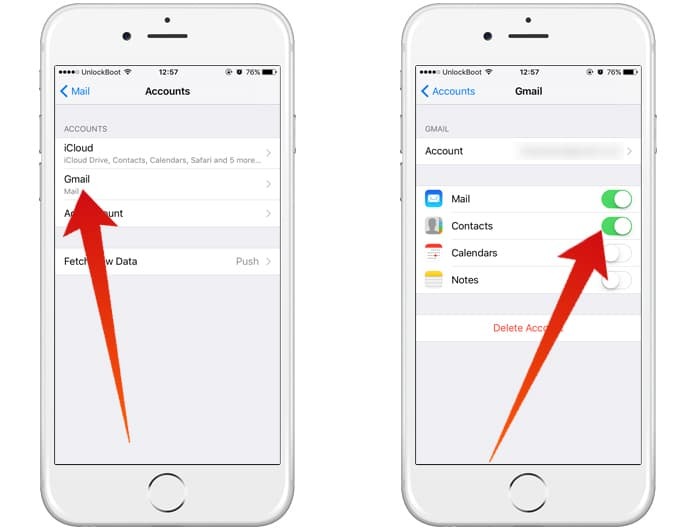 Go to Settings -> Mail -> Accounts -> Gmail and enable to Contacts option to sync your contacts. Your Contacts will be transferred to the new device in few minutes. This method can be used to transfer contacts from Android to iPhone or vice versa. Connect the old iPhone to your Computer and open iTunes. Select the device from the top -> click Info and click Sync Contacts. Click on the Sync button to sync your contacts with your Computer. After that, disconnect the old iPhone and connect the new iPhone. 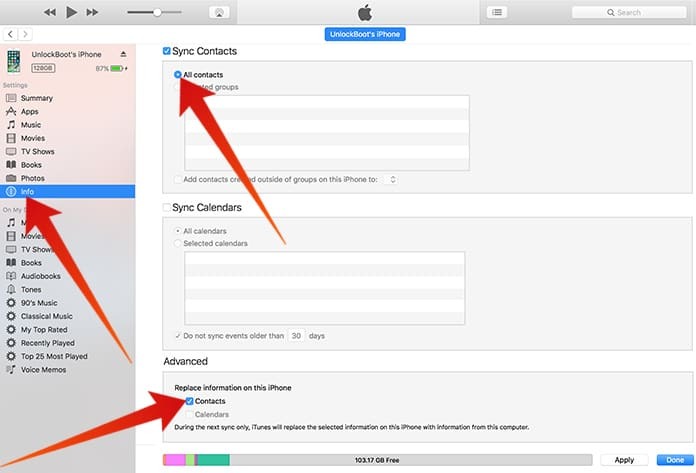 Make sure that the Sync Contacts option is selected. From the Advanced option, make sure that the Contacts option is selected. Click Sync to transfer your contacts from the old device to the new one. After you click the Sync button, all contacts will be removed from the new device and they will be replaced with the new contacts. If you want to merge your contacts we recommend you to use this method. You can easily transfer your contacts using an app, and you will need a computer to do this. Here is the process of transferring the contacts. Step 1: First of all, download any app that provides transfer of contacts from one iPhone to another like My Contacts Backup or AnyTrans. In this article, we are going to use AnyTrans. Step 2: Download and install AnyTrans on your Mac or Windows PC. Step 3: Now connect your both devices to the PC or Mac using the USB cable. Step 4: Open the AnyTrans app and click on the Clone Device option. Step 5: Select the Source and the target device to start the transfer. Step 6: Now select the contacts option to transfer all contacts to the another iPhone. Step 7: Click on the next button (the right arrow) to start the contacts transferring process. Hence you can easily transfer contacts from one iPhone to another. You can use any app to transfer the contacts. You can also use the backup and restore option which is the quickest and easiest way.